This program will be featuring my just recently updated white paper Astronomy Resources 2018/. We will be highlighting the latest and greatest resources and sources covering astronomy resources, sources, search engines, subject directories, articles, guides and tracers….literally everything on the Internet covering ASTRONOMY!! We will also be discussing my latest freely available Awareness Watch Newsletter V16N6 June 2018 featuring Grid, Distributed and Cloud Computing Resources Primer 2018 as well as my freely available June 2018 Zillman Columns highlighting Tutorial Resources 2018 – 2019 On the Internet. You may call in to ask your questions at (718)508-9839. The show is live and thirty minutes in length starting at 2:00pm EDT on Wednesday, June 27, 2018 and then archived for easy review and access. Listen, Call and Enjoy…. The above is the associated white paper link dataset compilation of the Astronomy Resources 2018 Subject Tracer™ Information Blog by Marcus P. Zillman, M.S., A.M.H.A. It is now a 28 page .pdf document 238KB. [Completely updated with all links validated and new links added on May 21, 2018] Other white papers are available by clicking here. [email protected] is a scientific experiment, based at UC Berkeley, that uses Internet-connected computers in the Search for Extraterrestrial Intelligence (SETI). 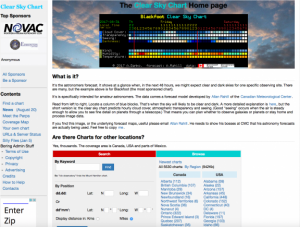 You can participate by running a free program that downloads and analyzes radio telescope data. This will be added to Grid, Distributed and Cloud Computing Resources Subject Tracer™. This will be added to Astronomy Resources Subject Tracer™. This will be added to Business Intelligence Resources Subject Tracer™. This will be added to Entrepreneurial Resources Subject Tracer™. This will be added to the tools section of Research Resources Subject Tracer™. The above is the associated white paper link dataset compilation of the Astronomy Resources 2017 Subject Tracer™ Information Blog by Marcus P. Zillman, M.S., A.M.H.A. It is now a 29 page .pdf document 243KB. [Completely updated with all links validated and new links added on November 10, 2017] Other white papers are available by clicking here. The above is the associated white paper link dataset compilation of the Astronomy Resources 2017 Subject Tracer™ Information Blog by Marcus P. Zillman, M.S., A.M.H.A. It is now a 29 page .pdf document 243KB. [Completely updated with all links validated and new links added on August 18, 2017] Other white papers are available by clicking here. The above is the associated white paper link dataset compilation of the Astronomy Resources 2017 Subject Tracer™ Information Blog by Marcus P. Zillman, M.S., A.M.H.A. It is now a 29 page .pdf document 245KB. [Completely updated with all links validated and new links added on May 15, 2017] Other white papers are available by clicking here.